MURDER NEVER TAKES A HOLIDAY! Pack your bags and buckle up! We’ve got eight exciting tales of mystery and murder, each with a twist you won’t see coming. 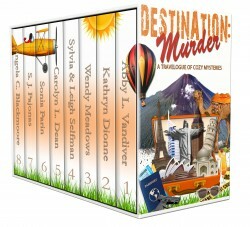 Destination: Murder is a limited edition, cozy mystery boxed set with eight full-length, never-before-published novels from eight bestselling authors.